Oh, it’s real, all right. And incredibly beautiful… the color, the proportions, the apparent 3D perspective of this grand icy world. It is arguably the finest sight accessible with a small telescope. The planet reaches opposition on June 3, 2016 and will remain bright and large in a telescope over the next few months. Here’s how to find it and see it in a small telescope. Saturn reaches opposition in the southern reaches of the ecliptic this year just east of Scorpius in the constellation Ophiuchus (see below). The planet has been retrograding westward against the stars since March 25 and resumes its eastward motion on August 13. 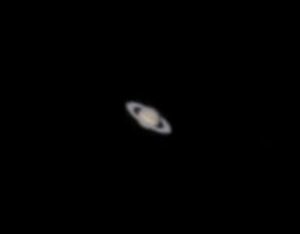 Saturn shines at magnitude 0.0 and keeps company with Mars, a planet which just past its own opposition on May 22, and in early June still outshines Saturn by two full magnitudes. The red-supergiant star Antares, a magnitude fainter than Saturn, lies to the south. While Mars and Antares are clearly orange to red-orange, Saturn is a pale sand color. At opposition this year, Saturn lies about 837 million miles from Earth. Saturn, Mars, and Antares in the southeastern sky a few hours after sunset in early June as seen from the northern hemisphere. This view is seen nearly overhead for observers in the southern hemisphere (courtesy of SkySafari). Saturn is one of the finest sights in a small telescope, even for beginners, and the planet reveals much to a patient observer. There are the rings, of course, with their complex structure and segmentation. You’ll easily see the two main A and B rings, and in steady skies at 100x or more, you may see the large gap between the two main rings. This is the Cassini division. Can you discern the difference in brightness between the two rings? Most observers agree the outer ‘A’ ring is fainter than the inner ‘B’ ring. If you have rock-steady sky and a 12-inch or larger scope, look for the elusive Encke division, another gap near the outer edge of the A-ring. More than most planets, Saturn displays a striking 3-D effect caused by the darkened edges of the disk and, when you can see them before and after opposition, the shadows cast by the rings on the planet. The apparent tilt of the rings this year is about 26o, nearly as large as it gets, and you may be able to trace the outer rings all the way around the planet, even the far side. Also in the days around opposition, you may see the rings shine a little brighter than in the weeks before and after opposition. This is a consequence of the Seeliger effect, the temporary disappearance from our point of view of the shadows of the tiny ice particles that make up the rings. The architecture of Saturn’s rings and cloud bands (image credit: Robert English). Like Jupiter, Saturn has a complex system of cloud bands visible with a small scope. But the planet is twice as far from the Sun as Jupiter so it doesn’t receive enough energy to drive as much active weather. The pale whitish-yellow bands on Saturn are by no means as obvious as Jupiter’s, but they are visible through most scopes. A yellow filter may help bring them out a little. And there are the moons of Saturn. The brightest is Titan, a moon which you can see with binoculars. A 6-inch or larger scope may show the color of the dense yellow-orange clouds on this large 8th-magnitude moon, the second largest in the solar system. The clouds hide the entire surface of Titan. Which is too bad, because lakes of liquid hydrocarbons are spread across the rugged terrain of this planet-like world. With a telescope of 4-inch aperture, and dark sky, you can also find the moons Iapentus, Rhea, Dione, and Tethys, all of which are approximately magnitude 10-11. It’s hard to tell one from another. To sort them out, try this online tool at Sky and Telescope. Saturn delights most stargazers, but it can be frustrating to observe, especially this year when the planet is low on the horizon for northern observers. The visual image of the planet in a telescope is often small. And if the atmosphere is not steady, the image tends to ripple and blur the delicate details in the clouds and the rings, so it’s never as clear as you see in professional images taken with big scopes. Binoculars of 10-12x will show Saturn as a tiny, slightly non-circular disk, and they show Titan as a tiny point. But that’s about it. 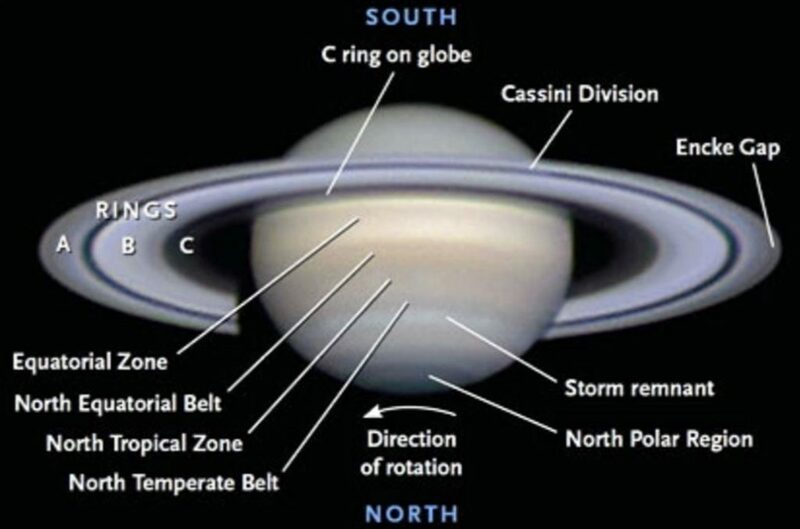 To clearly see the rings of Saturn, you will need a telescope. Which telescope? Really, any telescope will give you a good view of the planet. Refractors of longer focal length tend to give larger high-contrast images of planets. Reflectors have a little less contrast because of the central obstruction of the secondary mirror. But if they are well collimated, reflectors do a fine job with planets. Most of the best amateur planet imagers, for example, use SCT’s and Newtonians because these telescopes are available in higher apertures, and higher apertures enable higher resolution. First, before you get started observing Saturn, make sure your telescope is aligned and cooled down to ambient temperature. If you just take it from a warm house into the cool night air, there will be eddies of air in the telescope tube and movement of the mirror surface that will badly degrade the view until the temperature of the scope equlibriates with the rest of its surroundings. It will take between 20-60 minutes for the scope to settle down, depending on the size of the mirror and lenses and so on. Also, it helps to wait until Saturn is as high in the sky as possible before you observe. As mentioned, this year and for the next several apparitions, Saturn is south of the ecliptic and will never rise very high for northern-hemisphere observers. It is extremely well-placed for southern-hemisphere observers this year, however. Don’t expect a Hubble-like image. Despite its beauty, Saturn appears quite small in a telescope. The disk is only 18″ across at this opposition, about 1/3 the apparent size of Jupiter at its closest and about the same size as Mars at its opposition this year. The rings extend farther, about 45-50”, which makes the planet appear larger but even with the rings it’s never larger than Jupiter at opposition. You can never see Saturn through a telescope quite as well as you would like to. Once you get the planet in view, pop a low-power eyepiece in your scope. At 25x, you’ll see Saturn as non-circular, and 50-60x should reveal the rings and the planet’s disk. Now move to at least 100x and take in the view. The image will appear larger but a little fainter and possibly a little fuzzier. But keep moving to higher magnification until the image gets too fuzzy or faint. The optimum magnification depends on your telescope and seeing conditions. In steady sky with a high-quality scope, you can get up to 50x to 60x your telescope aperture in inches, and if you can make it up to 300x or more in steady sky, you will get an excellent view. But it’s not often you can use that much magnification. You need to experiment each night to determine the optimum magnification that will give you the best trade-off between image size, sharpness, and brightness. And yet if you’re patient, you can see a lot of detail on Saturn, even though it may be frustratingly small. Even nights when the air isn’t so steady, wait for moments of good seeing when the image will suddenly sharpen and jump out at you like a tiny hologram. It’s darned impressive. A colored filter, especially a #80A blue filter, can help you see fine detail near the poles and in the cloud bands of the planets. From Earth, the view of Saturn and its rings changes slowly as the big planet revolves around the sun every 30 years. Most of us, with a little luck, will get to see Saturn’s full range of faces just once or twice in our adult lives. So don’t waste this opposition… head out when skies are clear to see the ringed planet for yourself.